ASIS Victoria Chapter Wins Website of the Year Award | Mad Web Skills | Web design, development and hosting in Shepparton, Melbourne, Bendigo, Echuca, Benalla, Central Victoria and beyond. 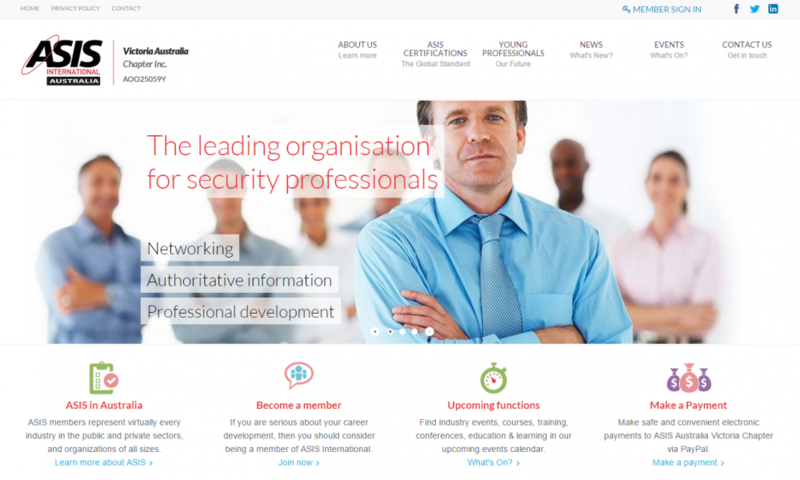 Built on top of Mad Web Skills' own DevFlare Content Management System (CMS), the ASIS Victoria Chapter website features a secure "members only" section and online event registration with PayPal integration. Mad Web Skills was approached to develop a new website for the Victoria chapter in 2013, with the goal of being their first point of contact for the organisation, while promoting upcoming member events and increasing membership. This annual award was launched in 2002 and recognizes chapters for outstanding web design and content, as well as encourages the development and continual improvement of all ASIS chapter websites. Entries are evaluated over a six-month period on criteria including web content quality, consistency of updates, as well as overall look and feel. ASIS International is a globally recognized leader advancing security worldwide, promoting excellence and leadership in the security management profession. Established on 18 June 1975, the ASIS Victoria Australia Chapter was the first Australian Chapter formed, providing members and the security community with access to a full range of programs and services. It was a great experience working with Dr Tony Zalewski and the Executive Team at ASIS Victoria Chapter - one made even better with the recognition received by this prestigious award.